For Dwight Twilley and Green Blimp, it's as though the '80s never ended. Oklahoma native Dwight Twilley has had a long and storied career with just as many successes as near misses. He is best known for two Top 20 hits, 1975's "I'm on Fire" and 1984's "Girls", the latter of which was popular on MTV back in the day thanks to a racy -- some would say sexist -- video. However, Twilley also suffered setbacks when his 1976 song "Shark (In the Dark)" was debuted on American Bandstand, only to be yanked as a single by his record company for fear that the buying public would too closely associate it with Jaws and deem it a novelty tune. He also had problems in 1986 when his album Wild Dogs landed with a thud in the midst of a payola scandal involving the president of his record company, too. Still, Twilley is a survivor and continuing to make jangly power pop in spite of the fact that he turns 60 next year. His latest album, Green Blimp, is a collection of 12 cuts alternating between hard driving and poppy, with median run times somewhere around the three-and-a-half minute mark. Also, the album is notable for marking the return of original guitarist Bill Pitcock IV to the lineup. 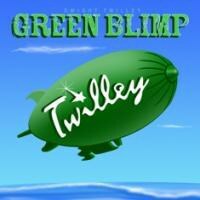 With Green Blimp, though, it would appear that Twilley is stuck somewhere in the mid-'80s as the songs, which feel a little rote by Twilley's standards, have a dated production sound that is big and glossy, if not digital; the tunes wouldn't seem out of place being played in some greasy midwestern bar's jukebox. Still, while there's nothing as striking here as 1977's "Looking for the Magic" (arguably his best song), the record should please long-time fans. One caveat, however: the song "Doctor" is about, well, playing doctor with your little sister who is "outside playing jacks." Ewww! Granted, anyone who remembers Twilley for "Girls" knows that he's not exactly a class act, and as "Doctor" suggests, "Twilley don't mind" what anyone thinks. For Twilley and Green Blimp, it's as though the '80s never ended. Party on!